Roman Holiday – Run. Ride. Roam. I know, I am far, far, far from having anything in common with Audrey Hepburn, sadly, and I don’t know that Steve could ever be compared to a young Gregory Peck, but we’ll be happy to share one thing with these two timeless stars – a Roman Holiday! The Big City was today’s destination and after bidding farewell to our friendly cabin cat, who had befriended us on arrival and was still on our doorstep this morning, we pedalled off, once again in sunshine. We were on our cycle path too! Wonders! No traffic! Aaaah, out of traffic! Well, no four wheeled traffic anyway! Our wheels were four of many because the MAMILS were out in force. In fact MAMILS on mountain bikes were the order of the day, because those Middle Aged Men In Lycra were everywhere on the bike path, heads down, shimmering lycra covering those middle aged torsos and tushes, wobbly bits and all. They whooshed up behind us, whizzed beside us and barrelled along toward us, with most of them giving a wave or a greeting. Maybe there was a MAMIL convention on, guest speaker Simon Spandex on the topic of “Losing Lard the Lycra Way” with the breakout session “Fashionably Fabulous at Fifty: Where Lycra And Style Collide” with Frederico “The Fluoro” Fantallini. Whatever was going on, there were fellas on their mountain bikes everywhere and it was a delightful way to spend the morning, pedalling along and exchanging greetings with these Lords of Lycra. The runners were in abundance too, which was great and what was super great, was the variety of runners out there. Every age, shape, size, pace and style were trotting, jogging and stepping along the path before and behind us. “Good work” I thought of them to myself. I love to see people out there having a run, no matter how fast or slow, how big or small, how young or old, just getting out there for the fun and fitness of it. Good on them one and all!! 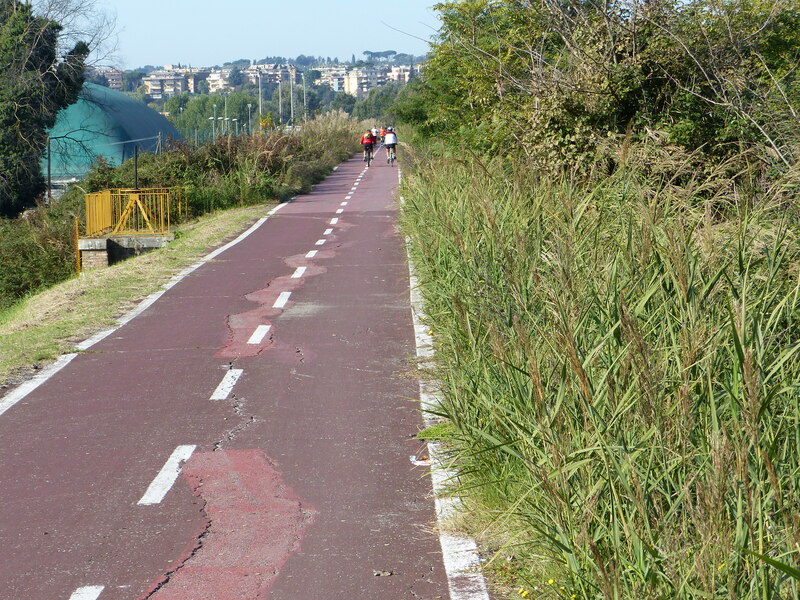 The bike path eventually ended and we were in Rome proper. There are some words I could use to describe the atmosphere of the city, from the point of view of a heavily laden, foreign cyclist: chaotic, psychotic, cacophonic or just plain mad and frightening! Traffic was everywhere, horns were blaring (Italians really seem to like using their horns! ), cars were at every angle in and around intersections, cars were parked in and around intersections, pedestrians were ignoring the traffic and just strolling into and around intersections and we were in the thick of it, trying to get to where we were going without becoming collateral damage in the morning’s melee of motors. We weren’t getting off lightly either, with a hill free day. Oh no, Rome decided to give us some of those just for good measure, with some streets that had enough incline to work the gears, legs and lungs. 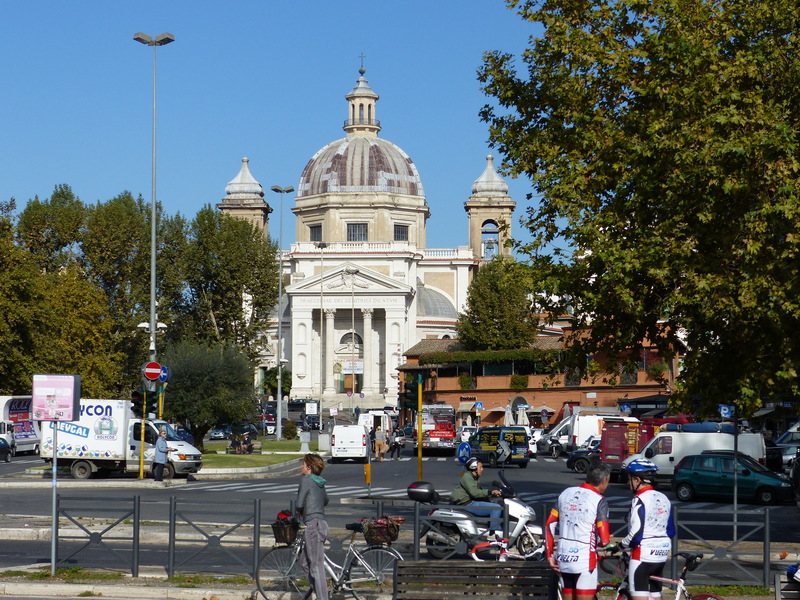 We powered through the traffic, powered up the hills and powered on to find the street where we would be staying during our time in Rome. We again have a small apartment, located about 1km from Vatican City, which we eventually found after a ride that added a few more grey hairs to our already silver tinted locks. We had quite a bit of time before checkin, so we pedalled on in search of a park to sit and wait it out. 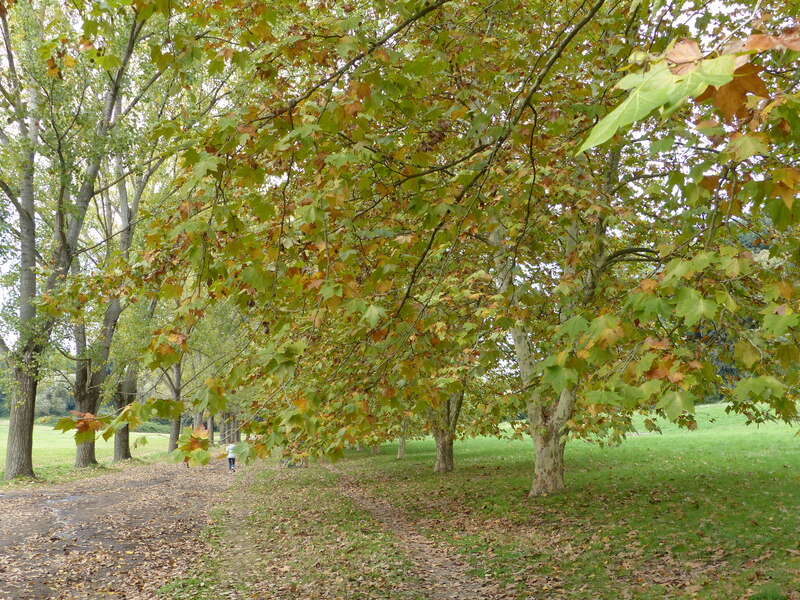 That required more hectic, hair raising, dodging and weaving and intersection navigation, in the torrent of traffic, but we finally located a large, very nice park, full of walkers, joggers and dogs. We found a bench and parked ourselves for some elevenses and settled in for a wait. We watched the variety of canines enjoying their Saturday turn about the park and I watched the many runners going past, again in all shapes and sizes, each with a form and style all their own. It was wonderful to see. The phone rang before too long, with the owner of the apartment telling us we could arrive early, so a short time later we saddled up again, rode once more into the fray and backtracked to the location of the apartment. We were met by the very lovely and friendly Alessi, who was quite amazed to see the load we were carrying on the bikes. She showed us inside, but with the elevator having the dimensions of a small refrigerator, we couldn’t follow her up to the apartment as a complete team. I waited downstairs with the bikes and began unloading everything, while Steve joined Alessi and was escorted to the fourth floor apartment for a tour and introduction to what will be our temporary home for a week. When they returned, we thanked Alessi and said our goodbyes, at which point we loaded all the panniers into the lift for the first ride up to the apartment. Then I went in, with my bike rearing up on its hind wheel and me standing and holding it in its rearing position, for the ride up in the Kelvinator fridge. Steve had to take the stairs! His big bike wasn’t going to fit in at all, and certainly not with him in there as well. We finally made it into the apartment, as a complete team, with bikes, gear and two cyclists and we began to settle in. Steve immediately made for the couch and enjoyed the treat and luxury of a long and large seat, and I parked myself at that favourite novelty “the table”. The afternoon was then spent getting our bearings, settling in, gathering supplies and planning our Roman adventure for the next few days. In Steve’s world, happiness is a comfy chair! Who knows, we may even spot Il Papa. A few weeks ago, footage was shown on the news of Pope Francis in an optometrist’s in the city. He was in there trying on new glasses, as if he were any Jo Blow off the street! So we may see the Forum, the Colosseum, the Pantheon and a Pope! Anything could happen, goodness me, we might even have a few days of sunshine! How amazing that would be! Our rendezvous with Rome awaits. Pick the day. Enjoy it — to the hilt. The day as it comes…Not to live for the day, that would be materialistic — but to treasure the day. I realise that most of us live on the skin — on the surface — without appreciating just how wonderful it is simply to be alive at all. Dave + Downpour = Difficult Day!